The Archaeology of the Petrified Forest – Trip full. Waiting list only. Explore the archaeology of the Petrified Forest National Park with Park Archaeologists Bill Reitze, Amy Schott, and Erina Gruner. Petrified Forest hosts 13,000 years of human history, including hundreds of petroglyphs sites, an amazingly dense prehistoric occupation, and a rich historic record. 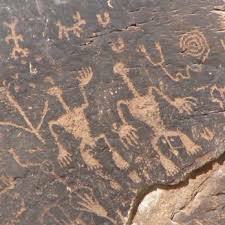 Saturday will include a mix of pueblo, historic, and rock art site visits including several short hikes in the core of the park. Sunday will involve longer backcountry hikes into sites in the park’s new expansion lands, finishing early afternoon. Both days we will meet at the park headquarters off I-40 at exit 311. The Visitors Center is about a 30 minute drive from Holbrook where motels are available. To sign up contact Cannon Daughtrey. The trip is limited to 20 people and we will arrange car pooling from Holbrook to limit the number of vehicles.